My view on the world, as a Councillor, mother, and campaigner for Scottish independence. Welcome. A few things have recently been rattling around in my head which concern women in politics; I've been trying to gather some ideas as to why there aren't more of us, and how I might encourage female candidates to come forward. At the same time, I noticed that the launch of the Counting Women In campaign, couldn't miss the outrageous attack on Dr Eilidh Whiteford MP, and I've been enjoying Winnie Ewing's very readable autobiography. I've also been out on the doorsteps for Ken Andrew in Hillhead. All of these together really say: the culture of politics in the UK is what's at fault. Women don't think it's for them and just disengage. Now, obviously that's a generalisation. I'm a woman, and I'm very engaged in politics. I'm prepared to accept I'm a bit odd. I chapped on a door the other week while canvassing. I had Alexander with me in the pram. A woman answered, I politely introduced myself and my purpose on her doorstep - she shook her head and told me she wasn't interested. I asked why. She firmly asserted that all politicians are just the same. I asked her if anyone from any political party had ever come to see her with a baby in a pram. She thought briefly, admitted that'd never happened, and sent me on my way. I'm not sure whether that experience tells me whether I ought to a) leave the wee man at home or b) work on my doorstep pizzaz, but I bet that woman had opinions on all kinds of things. I don't think she believes them to be particularly political - provision of care services, or bin collection, say - but in the end they're determined by politicians. I want women like her to tell me what she wants and why it matters. More than that, I want women who care about issues to join political parties to further that cause. There are all kinds of causes promoted within the SNP, and I will most likely welcome you in. I'm sure I've said before that I've always felt welcomed as a woman in the SNP, and that remains true. I'm not sure how Labour men treat women in general (not great by some accounts, which appear to be no barrier to reselection), but they're certainly not great at giving SNP women the respect they are due. As the lone SNP member in the Commons - at best an intimidating place for an inexperienced politician - she found herself without friends, without party colleagues, without any supporting structures. She was completely alone. She was hundreds of miles from her husband and her children in an excessively macho and very hostile environment. "I was treated as the enemy, I was shunned and despised. It's a peculiar experience to suddenly find yourself hated. At times I did feel terribly lonely, close to despair." Reading the autobiography, you really get a vivid picture of the pressure Winnie Ewing was under as an MP on her own. Her every action was scrutinised; if she didn't attend a debate, the other parties would ensure it got in the papers. The nuances of what said were taken apart. She was under political and personal attack from all sides and, even more sinister, stalked by another MP. Interventions by others had some impact, but it must have been a great emotional strain. What I didn't know was that when Winnie was appointed as an MEP (pre-democratic elections to Europe), the bad behaviour of two particular Labour bullies continued in the European Parliament when she was alone again, deliberately working to ridicule and undermine her for over a year. By the account in the autobiography, this only ended when the President of the Parliament intervened, threatening to have them withdrawn as being "not fit to represent their country and Parliament in Europe". You might think that, around forty years later, a female SNP MP might expect some kind of change to have occurred in attitudes, as with wider society. Women are accepted in a range of jobs, universities are gaining majorities of female students, there are innumerable opportunities and directions for careers. And then, there's Ian Davidson MP. "It does not matter that all I had done was disagree with the committee. In fact what inspired Mr Davidson’s remark is utterly irrelevant. There is no action, no misbehaviour that justifies the threat or act of “a doing”. We hear too often of women being told they were “asking for it” in justification for intimidation or violence. I never expected to hear that from an MP in Parliament. But this is not simply an issue of aggression towards woman; it’s about a culture of intimidation and bullying affecting men and women that seems to flourish with impunity in the Westminster world." The tragedy is that it's primarily through this Westminster lens that the viewing population sees politics and politicians. They see argument, they see confrontation; they see crowds of boorish suits moaning a weary "hear hear". And they switch off. They say "that's not for me". They don't see a politician arguing the case with a housing association, trying to help a vulnerable tenant. They don't see someone working on a committee, trying to improve a policy that will help improve children's health. They don't see the joy that is presenting prizes to year groups of school students, with the hope that you can encourage them in that tiny second as you shake their hand. They don't know what a privilege it is to be invited into so many lives and homes, to meet with groups and organisations and offer what help you can. The work of politics should never be that yah boo nonsense that men excel at and so many women hate. More women should be in politics for the fantastic difference they can make every day. I've been watching the new Glasgow Community and Safety Services building rise out of the ground near Bridgeton Cross over the past weeks and months, and on Thursday morning I got the chance to visit. Clyde Gateway were very helpful - both in minding Alexander while I donned a hardhat, and explaining how the building will work. It's pretty impressive - the atrium area (shown in the photo) will dominate the building. There's a lot of light too, streaming in the big glazed areas facing south on London Road. The views over the city from the upper floors are also impressive - you can see the City Centre rooftops, up to Dennistoun, along to the new velodrome. Part of the rationale for the building of the offices is to show other developers why locating in Bridgeton can work for them - the development's still a few months away from having people sitting at desks, but you can just about imagine people working and meeting in the different spaces. Local people have been employed in the construction works, and although most of the jobs will be moving from a City Centre office to this one, this kind of development could really be a boost to local businesses, cafes, shops, and even various other retailers. It'll bring life to a bit of London Road that's quite lonely at night. I'm looking forward to going back in the New Year, when more of the building works will be nearing completion. Posted originally on the SNP website on Friday. I love coming to SNP conference in Inverness; it was the first one I came to in 2003, so I always associate it with that first time and the excitement I felt then. It was really something to be a young activist in the Eden Court, knowing that I shared a belief in independence with so many others. The party remains full of bright, committed, friendly people, and I think it’s one of the SNP’s greatest qualities. Being in the SNP is being part of a family. Even as I write this blog, on a laptop at the foot of the stairs in the old Bishop’s Palace part of the Eden Court, everyone’s been stopping to say hi and play with Alexander (aka Baby Nat) – Alex Salmond paused before his press interview to say hello (and has since come back and chatted about Casablanca), Auntie Nicola came to compliment him on his shoes, John Swinney was came and played a while with Percy, but Angus Robertson’s magic ear trick was sadly rebuffed. He's going to try again tomorrow! It was in this friendly vein that Nicola’s speech began with by wishing Allan Angus – a fantastic activist I got to know living in Aberdeen – a very happy 78th birthday, and promising the twinkle-toed charmer a dance at tonight’s ceilidh. Her sincere thanks to activists for their hard work over the years was equally as warm and genuine. I love to hear people talk about independence and the way that it motivates and inspires them. It’s different for everyone. There’s been a real focus in speeches today on independence as a means of bettering future generations – doing well by our children and their children. Alex Neil spoke of his renewed enthusiasm (not that it needed renewing!) since becoming a grandfather. Nicola spoke of the aspirations of working class families, who can be sure that their children will make it to University without being inhibited by fees. I was speaking to a very proud mum in my ward last week, whose daughter is now in second year at Uni. Her eyes were shining with joy, telling me how well she’s getting on. I’m just delighted to be part of a party that values free education. “Independence means no longer having to watch our national wealth being squandered by Westminster governments. "Independence means having an economic policy suited to our needs, with increased capital investment supporting and creating jobs. "Independence means having a welfare system that can tackle the scourge of child poverty. It means not having to put up with Tory policies that will consign tens of thousands of our children to a life of deprivation. "Independence means deciding for ourselves whether to send our young men and women into conflict. And it means knowing that we need never, ever, again be dragged into an illegal war. "Independence means getting to decide our own priorities. "And, delegates, independence will mean no longer having to put up with the obscenity of Trident nuclear missiles on the river Clyde. "Delegates, Our case for independence will be based on the simple but powerful belief that, as a country, we are better placed than anyone else to take the right decisions for our future. "That with the talents and skills of our people, and control over our own resources, we can build a more successful, prosperous and socially just country. This, as delegates, we already know in our hearts and our heads. I’m just loving taking that message out on the doorsteps, and those I’ve spoken to the doorsteps have been keen as well. I've been keeping an eye on the renovations to Parkhead Library. When the library closed on the 11th of April, it was due to be closed for twenty weeks. I contacted Glasgow Life last week to see if they had a date for re-opening, but sadly it'll now be the week beginning the 3rd of October before the library is open to the public again. resulted in a slightly longer timescale for the re-opening of the library." monitor the situation and will update on here if I get more info! It's my third wedding anniversary today, but thoughts of marriage have been playing on my mind since last week, when John Mason laid down his controversial motion in the Scottish Parliament. During summer recess when MSPs are in their constituencies (not on holiday, as some may think), visiting organisations and constituents and taking the time to prepare for the session ahead. This is particularly true of those newly - elected MSPs. It's not really a time to take stances unless you're very keen to do so, as anything remotely newsworthy is certain to get in the papers. And so it does. The motion, and the interpretation of it has provoked a lot of debate, both within the SNP and outwith. It has opened the party to criticism, when the notion of disapproving of equal marriage is not party policy or anything approaching the view of most members I know. Three years ago, Joe and I had a civil ceremony in the beautiful Trades Hall in Glasgow, where we were strictly instructed not to mention God or religion anywhere in the proceedings. My family are notionally Church of Scotland, but since I hadn't been any kind of regular attendee at any church, I felt it would be a bit rude and hypocritical to suddenly decide that I wanted to be married in a church. It was a lovely ceremony, with poems by my brother and Joe's brother, and family and friends around us. I can't support the current situation, where for some, a marriage can't be called a marriage. To me, that is immoral and discriminatory. If two people love each other enough to stand up in front of friends and family, to commit to sharing a future together, they deserve to be recognised and celebrated by society, regardless of their gender. Some Churches may question this, but I wonder what their opposition serves other than to turn people away from organised religion. It may be that we could consider adopting practice such as in France, where everyone has to have a Civil Ceremony, followed by a religious one if people so choose. For the sceptics and the critics, it's worth noting that an increasing number of MSPs have signed Patrick Harvie's amendment to John's motion. I hope that those who try to pin a badge of inequality on the party I love will bear this in mind. The past few months have flown past scarily fast. 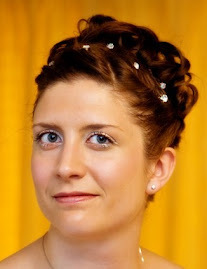 I never intended to give up blogging - I just couldn't find the time and energy to devote to it. I do think it's important though, and I hope (having given the blog a wee facelift) that I'll manage to stage a return to blogging. I put a fair bit of effort into establishing and keeping up the blog; with so much going on in my ward, it would be a shame to let it die now. Twitter has been a good medium for sharing news quickly, but it lacks the depth of information or opinion that a good blog post can provide. So please forgive me blogosphere, and watch me fill this space! 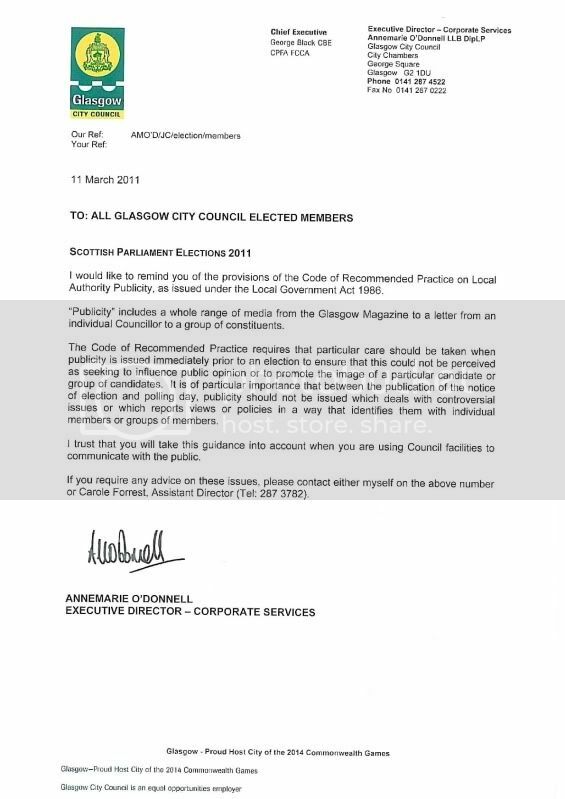 Just the other day, this letter appeared in my inbox, warning Councillors that we should be very careful what we send out during the period of the Scottish Parliament elections Quite right too - and not only because there are several Councillors bidding for one seat in particular. You'll see in the second paragraph that the Glasgow Magazine is mentioned - how odd therefore that the Council itself has been caught using that very publication to make blatant party political statements! I spend most of my time campaigning for the SNP, in the hope of winning Independence for the people of Scotland. I was elected on the 4th of May 2007 to serve the people of the new Calton Council ward in the east end of Glasgow. Where the photos on this blog are mine, any reproduction requires my written permission. 2nd Thursday of the month at 10.30am - Dalmarnock Centre, 3 Lily Street. 3rd Wednesday of the month at 6.00pm - Dalmarnock Primary School, 111 Baltic Street. 3rd Thurday of the month at 12 noon - Helenslea Community Hall, 48 Methven Street. 4th Tuesday of the month at 10.00am - Bridgeton Library, 23 Landressy Street. 4th Wednesday of the month at 6.00pm - St Mungo's Academy, 235 Crownpoint Road. No Surgeries during school and public holidays (as schools will be closed). Home visits can be arranged for constituents unable to attend surgeries. Fighting fire with fire to tackle Scotland's wildfires - Scotland's fire service is to introduce a controlled burning regime as the problem is predicted to worsen. Scottish Government news app - The Scottish Government news app will no longer function after Thursday, March 24.